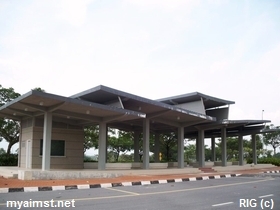 The Aimst Bus Station, like any other bus station, is not unusual, but the green surroundings it makes it special. Trees, flowers, roads and birds, the few things can be appreciated during the boring long wait for the bus to arrive. The Multipurpose indoor sports complex is just behind the building. A view across the road. Greeneries along the main road. The Administration Building behind the trees. The car parking lot beside the building. This entry was posted in Aimst University Semeling Campus Photo Tour and tagged aimst university, Photo. Bookmark the permalink. . Print .